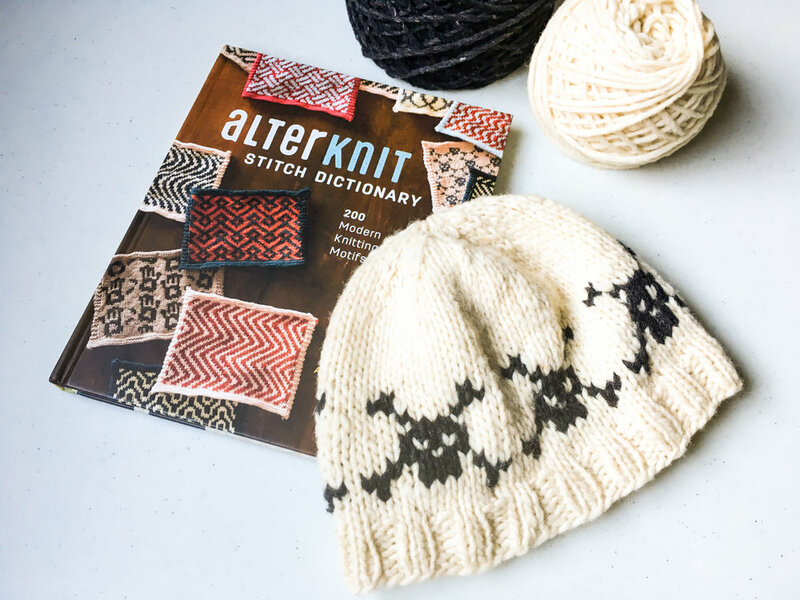 Here's how to use AlterKnit Stitch Dictionary to knit a pirate hat! I love knitting with two colors, but I know it might seem intimidating to some knitters. So me and Sean made this video using a motif from our book, AlterKnit Stitch Dictionary, to help demystify it! The free hat pattern I used in this video is Scherer and you can get it right here! You can make this hat with other motifs too! Since Scherer has 72 stitches around the brim, you could use any motif that’s a multiple of 4, 8, 9, 12, 18, 24, or 36. AlterKnit Stitch Dictionary includes an index by stitch count, so it's easy to find which motifs have those multiples. I also made a pirate hat using my Tolt Hat as a base with YOTH Daughter. Only the smallest size of Tolt works with the Jolly Roger motif because the 12-stitch repeat motif fits into the 96 stitches of the small size perfectly. Spread out your stitches on your right needle before knitting with the next color. The Jolly Roger motif has some long stretches of one color (9 stitches on one row!) so it's important to keep your stitches spread out to avoid bunchy fabric. I didn't catch my floats at all for my hat because a hat isn't likely to catch on things. If you're using the Jolly Roger motif for other projects, it could be a good idea to catch floats every now and then. For more on floats, check out this tutorial: Catching Floats in Colorwork. For more colorwork tips, buy our book AlterKnit Stitch Dictionary! It's got a whole section on the technical side of knitting with two colors, including diagrams of how to hold your yarn, how to pick colors, and more!